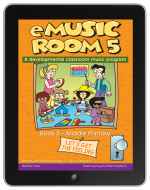 A comprehensive classroom music program by Fairbairn-Leehy-O’Mara. eMR6 Module 8 – Review and MUSIKWIZZ game show. *NOTE: These links show Australian prices. Your local price will be displayed on iBooks. 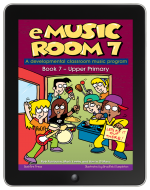 eMR1 Unit 1a Lessons 1-4 is vailable at under A$1 a lesson. No reason not to try! Go to the Apple Store for more information, a free lesson and to purchase. Written for students around their sixth year of primary school. + a module for detailed evaluation. Each module explores: chords and harmony, rhythmic & melodic composition, improvisation and lyric writing. The final module is a fabulous ‘Spicks & Specks/RockWizz/Never Mind the Buzzcocks’ style, team-driven multimedia game show. 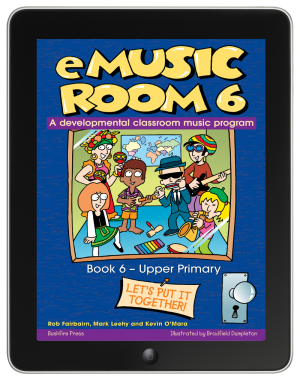 Music Room 6 includes over 30 videos: demonstrations of instruments, techniques & styles by specialist musicians, demonstrations of tuned and untuned percussion techniques, chord theory and much more (including material for use in the Music Quiz in module 8). Also includes bonus access to web extras: extensive background information, material, and useful links for the various musical styles covered + additional scores. eMusic Room on Apple iBooks is the complete electronic version of our famous Music Room series. Set out in actual lesson plans! 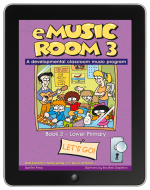 A fun, easy-to-use program for class teacher and music specialist. Lesson plans are exactly the same – but with all audio tracks, videos and charts embedded on the page EXACTLY as and when you need them. Videos and charts can be instantly data-projected for the class. 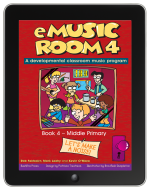 eMusic Room 1 on Apple iBooks covers the elements of beat, pitch, tempo, dynamics, context + end-of–year performance piece. eMR1 Unit 1a Lessons 1-4 is vailable at under A$1 a lesson. No reason not to try!